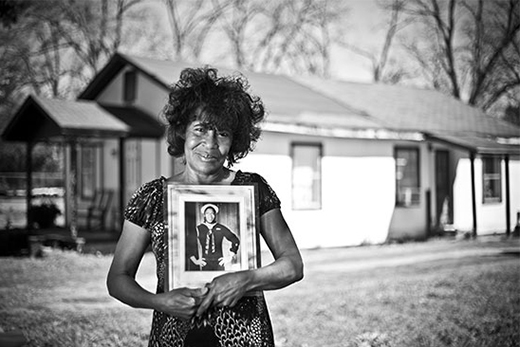 Verda Mae Brazier Bush holds a photo of her father, James Brazier, in front of the childhood home where she witnessed him being beaten by police in 1958. Five days later, on April 25, 1958, James C. Brazier died of injuries caused by blunt force trauma to the head. In the next few months and years, the Brazier family would find no justice. Local authorities impeded an FBI investigation into the case through intimidation of witnesses, and an all-white grand jury failed to bring an indictment against the white police officers accused of beating James Brazier to the point of death. In 1963, Brazier’s widow, Hattie Bell Brazier, suffered another loss when a jury ruled against awarding her damages in a civil suit she filed in federal court. In 2006, as part of the US Department of Justice’s commitment to investigating and prosecuting civil rights–era homicides, the Federal Bureau of Investigation (FBI) began its Cold Case Initiative—a comprehensive program to identify and investigate racially motivated murders committed decades ago. The effort was reinforced in 2008 with the passage of the Emmett Till Unsolved Civil Rights Crime Act, and community groups, nongovernmental organizations, and higher education began to join the Department of Justice and the FBI in their efforts. Since 2011, Emory has offered an interdisciplinary Civil Rights Cold Cases class examining incidents that occurred in Georgia. Cross-listed in journalism, history, African American studies, and American studies at Emory College, the class arms students with historical perspective and principles of journalistic practice, then releases them to pursue new information related to the cases. In January, Emory’s Civil Rights Cold Cases Project launched a website, coldcases.emory.edu, that is the product of more than fifty students’ work during seven semesters of the course.